Because nerves and blood vessels are numerous about your face, being close to the brain makes them effective shortcuts to the brain center. Stimulating facial reflex points, then, provides a most efficient way to encourage your body to naturally restore balance among your body systems. Working through your Central Nervous System, your body responds to regulate and modulate the activities of your organs and systems to restore the flow of blood, lymph, nerve impulses, hormones, etc. to their optimal levels. Facial Reflex Therapy Sorensensistem� was devised by world renowned reflexotherapist Lone Sorensen. This system combines Traditional Chinese Medicine, South American Zone Therapy, and Vietnamese face maps and points with the most current modern knowledge of neuro-anatomy. 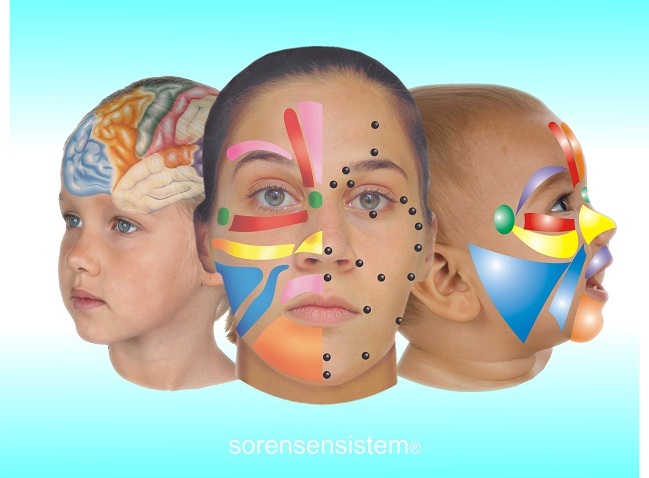 As designed, application of the Sorensensistem� by a Certified Facial Reflex Therapist can assess underlying causes of health impairment as well as help with symptom management. While specific conditions can be addressed with this Facial Reflex Therapy, health maintenance and facial rejuvenation are also beneficial applications. Facial Therapy sessions are often described as being deeply relaxing and soothing with a bonus of a healthier complexion and radiant face. Children and young adults have also benefited by the correction of difficulties associated with learning and school. Tension and stress held in your facial muscles are most directly transmitted to your entire body. Emotions are expressed or suppressed first on your face, for example. Chewing, teeth grinding, eye strain and fatigue, and even laughing cause some amount of tension that can lead to problems. When reflex points and zones are stimulated by a Certified Facial Reflex Therapist, endorphins and serotonin are released so you experience deep relaxation and rejuvenation. Research in the U.S. has found that 12% of children born under difficult labor circumstances suffer from what is termed �post-traumatic brain damage.� After a few Facial Reflexology treatments, a sense of balance and tranquility are often restored, giving the child more ability to learn and thus raising self-confidence. Temprana Therapy was created primarily to aid children with brain disorders. Autism related disorders, Down and other syndromes, speech problems, poor concentration, learning difficulties, dyslexia, hearing impairment, epilepsy, and other brain related disorders have all shown positive results not thought possible with traditional approaches. the IonCleanse� by AMD with children on the Autism spectrum. Read Lone Sorensen's inspiring story about how she developed Facial Reflex Therapy Sorensensistem�, opened several healing centers around the world, and helped both adults and children overcome difficult and impairing health conditions.